I finished this last weekend and, although Halloween is far away, I thought I'd post it while it's fresh in my head. (Images are clickable for enlargement). 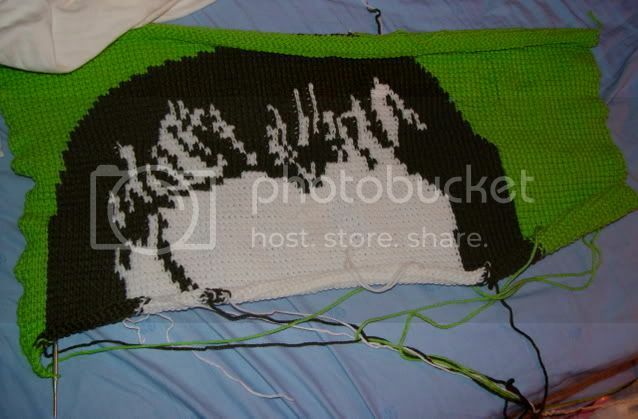 It's done in tunisian afghan stitch using a size J cabled afghan hook I got at Hobby Lobby. 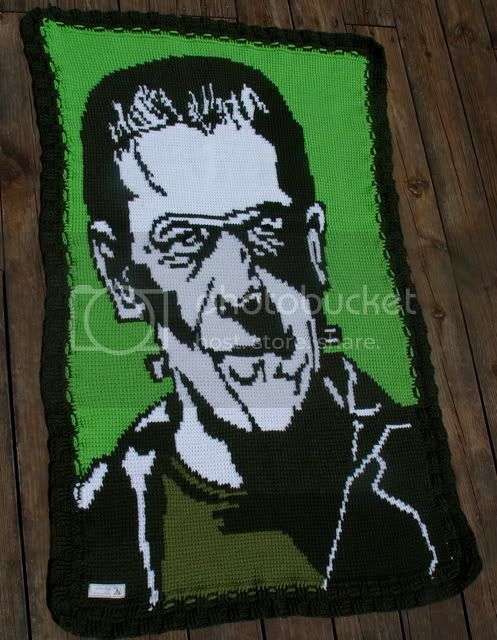 He began as a pile of yarn. See the cabled hook in the middle? This was after the first day. The hardest part was the hair so I was glad to get through most of that right off the bat. I began at the top of the head because the starting chain was all one color, (the Spring Green background color). It's much easier that way. If I started at the bottom, the beginning chain would have had many color changes in it and that's always tricky to do. The end of day two and I was still being very good and took this photo. But then I had to add a lot more colors for all the lines in his face and I decided then to just drop the photo taking. So, here he is then at the end. I trimmed it with the basketweave stitch, (my favorite to use). 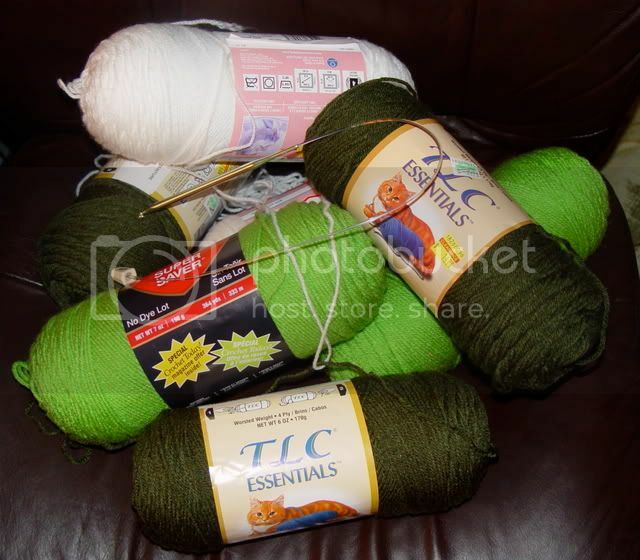 There's a bit more blathering on the color choices and whatnot in my blog, (link is below). I used a graphed stencil. 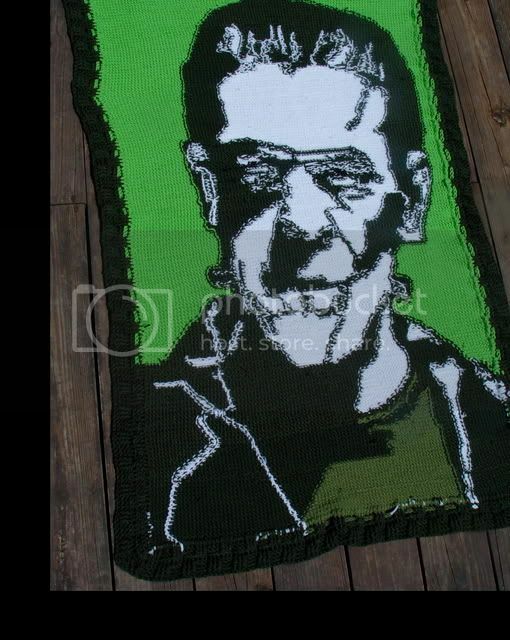 I was thinking of crocheting the Bride of Frankenstein too, (maybe a bit closer to Halloween). Anyway, hope you like him! I want to learn how to do that! How long did it take to do that? That is fantastic! I covet it! How big is it? I want to be slapped by an Epiphatree. he's incredible! 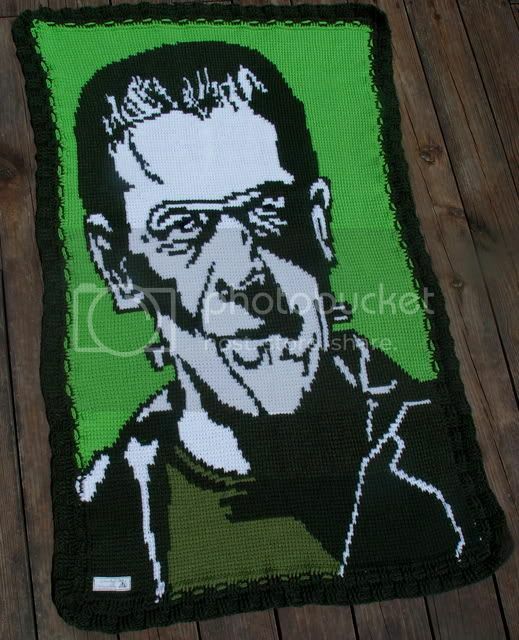 I thought at first it was a smaller one, but the pic with the yarn makes it looks like it's maybe 2'x4'? Is it really that large? that is awesome. great job!! This is one of the coolest things of all time!! For this, I vow to learn tunsian!!! You are totally awesome. THAT is totally awesome. I love it. I'm clicking 'this rocks'! You are totally making featured with this. You do absolutely amazing work! Yowzaah! Amazing job! 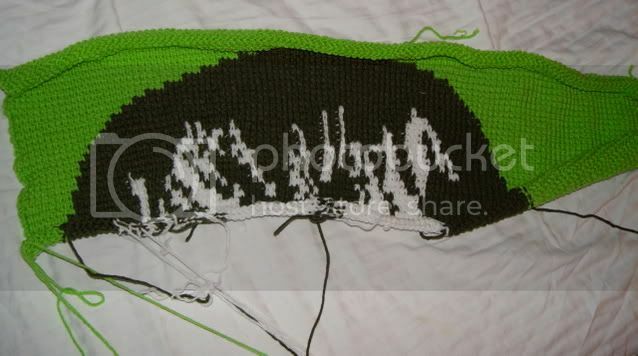 Didn't even realize you could switch colors with afghan...er...tunisian stitch.